In this post, you will find all relevant regulations for the use of drones in Mexico. The bad news right at the beginning: Foreigners are not allowed to fly drones in Mexico. However, I heard that a few exceptions exist, but unfortunately, I do not know them yet. Maximum altitude: The maximum ascent altitude is 120 meters in Mexico. Maximum horizontal distance and FPV: You must always be able to see your copter with the naked eye during the flight. Compulsory insurance: No information available yet. Of course, you are always on the safe side if you have drone insurance. Distance to airports: 9.2 kilometers distance must be respected between airports and drones. At a heliport, your drone may approach a maximum of 900 meters. Other safety distances: No data available yet. Flight bans: Drone flights are prohibited if a group of at least 12 people gathers. Flight Permits: According to forum reports, special flight approvals are required for flights to archaeological sites such as Chichen Itza. Operating Hours: Only in daylight can drones be used in Mexico. Rules for commercial pilots: No data available at this time. 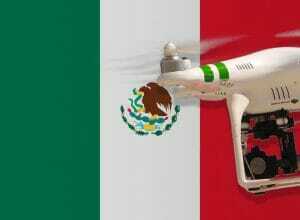 Good to know: From several sides, I have already heard that drones were confiscated in Mexico. That’s why I would always follow the rules. Supposedly some securities even have jamming devices that allow them to take over the control of your drone. No idea if it’s true, but I would not risk. We have researched the listed drone regulations for Mexico to the best of our knowledge. We cannot guarantee the correctness of the information. If you want to be on the safe side, contact the competent aviation authority. Alternatively, you can also ask the embassy in your country for further information about the regulations. Please leave us a comment when you receive news and/or gain experience with your copter in Mexico! Looking to work on a production shoot in Mexico next month with my Inspire 2. The information above says “Approval must be requested” for a drone of this size. does this approval mean a permit/where would i receive a permit at, or does it just mean i need to ask permission from a location coordinator? yes Ein, you need to fill a form, sent it on an e-mail attaching proof of purchase of your drone, s/n, scan or copy of your ID, and wait 5 work days to get approval from the MX government. they will sent to your e-mail a a paper work that allow you to use your drone freely on MX until Dec 2018 (as the law will change). After reading this post, I take some time to make a research on MX government website. BTW I’m Mexican citizen. and found the only issue from now until Dec 2018 (this year), is that any Drone with 2 Kg (a bit more of 4 Lb) or more, must be registered. How to make the registration?? = They asked to fill and submit to an email address (rpas@sct.gob.mx) the Form linked at the end of the page I will bring to you on this comment, including a photo copy of your proof of purchase or any document that proof you are the owner of the drone…, a photo copy or scan of your personal ID, and that’s it!! Any doubt, please comment on this forum, and I’ll be responding the soonest possible. Any idea what the changes are going to be in december? I had not heard of anything changing since october, but I’ve been out of the drone world for a few months so i need to catch up. Thanks! -To flew a Drone without license will be punished with a fine of up to $403K MX Pesos (about $21,210 USD). -To obtain the License will be required to take a flight training in a certified school, been Mexican since born, have at least 18 years old, had committed the Mexican Military Service, have at least a high school degree, and been physically able to pass the aeronautic health exam (which is a Must). It does say that they are not sure yet if drones that weight less than 2 kilos will be affected by this new rule. I arrived in Mexico mid Nov. 2018 with Mavic2 pro and had no issues. I will return to Mex next year in July, would they confiscate it if customs checks my hand luggage? Even if the law is changed, I’m really sure it won’t be confiscated, as is not illegal to own them or travel with them into Mexico, what they could do, is to ask you for the usage you will bring to the drone in Mexico, and here is when a smart answer will save you; as you may (by all ways) to let them know you are will to flight the drone legally, and will ask (or already asked) for the needed permissions to start using it, and that you are aware of the risk and penalties involved if fail to do so. I will suggest to make a quick research (few days before arriving to Mexico) to see if the rules were updated or not by that date, or you can ask in this forum for an update, and we will gladly help you out with it. I’m flying domestically in Mexico in the north in February. I’m concerned that security, when I pass it through x rays, might take my drone due to not having the required registration, since I’m a foreigner. I’m also in Oaxaca city for the next 2 months and wanted to fly it in the colonial center. Is the police or military in charge of enforcing this law? Would I get the big fine since my drone is below 2kgs? That’s what I didn’t understand. What are your thoughts? – DON’T fly on or over archeological sites, and DON’T publish videos/photos of them. There was a scandal recently about it, so authorities are specially in the look for that. Thanks for the update. I’ll be going to Guatemala in early Feb. and returning back to Mexico via Tapachula with the mavic pro. I guess since I’m not able to register the drone (now I understand that I won’t need a license to fly because of the lower weight), I’ll have to be cautious when and where I take off. Do you know if the new law is now in full effect? The new rules are valid? I cant find it on internet. Iam at mexico now, and Iam mad at it. 12-14-2018 –> Not yet, so far so good.